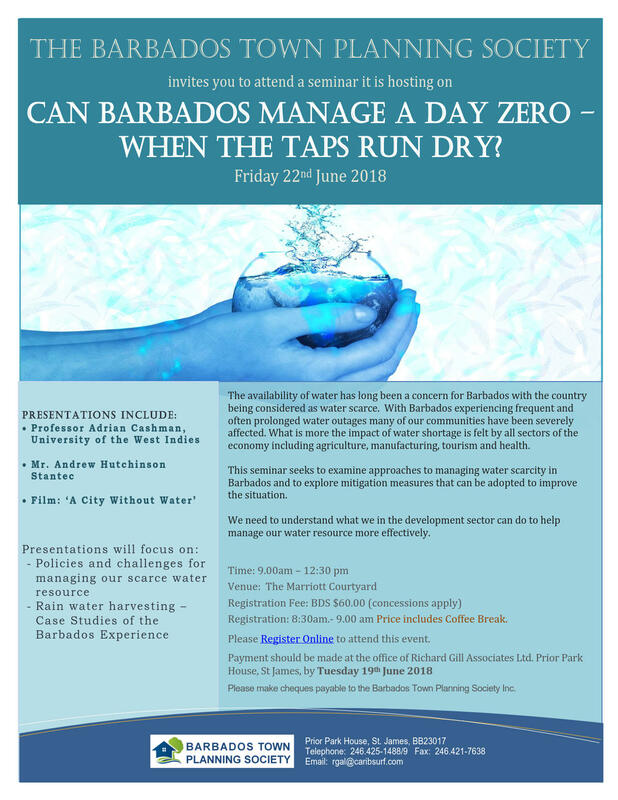 2018 Symposium: Can Barbados Manage a Day Zero When the Taps Run Dry? The Barbados Town Planning Society hosted a seminar on Friday 22 June 2018 entitled “Can Barbados Manage a Day Zero When the Taps Run Dry?”. It was held at the Courtyard Marriott Hotel from 9:00am to 1:00pm. Can Barbados Manage a Day Zero When the Taps Run Dry? The seminar explored the extent of the problem facing us, measured that we need to take to address the situation and what the town planning system and the development industry can do to assist. Mr Andrew Hutchinson – Stantec Consulting Caribbean Ltd. This entry was posted in Uncategorized by Andy Gill. Bookmark the permalink.